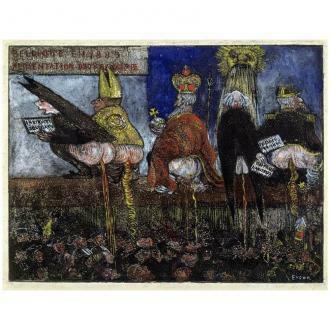 From 1886 onwards, humour becomes an important element in James Ensor‘s work. In the heavily populated tableaux, burlesque personages pop up. Stereotypes, carnival goers, devils, witches, nymphs and ballerinas are depicted in various comical situations. The artist combines these personages freely with the macabre figures and often places them in foolish fighting and murder scenes. He mocked historical personages and events such as the Persian King Darius, the Roman Empire, Mediaeval knights, the Battle of the Spurs, Philip II, Louis XIV and Napoleon. Clearly, Ensor did not sit well with the lawyers, physicians, artists, critics and power figures of his time. They take centre stage in his follies. Many paintings, drawings and etchings contain allusions that his contemporaries and intimates undoubtably understood better than we do. Also, in the hundreds of still lifes that Ensor painted late into his life, double entendre and humourous combinations of subjects are given their due share. Whether even the imitation of historical image genres, such as various religious themes or the 18th-century chivalries that he depicted, are partially or wholly intended to be parody, needs to be examined further.